Katy Perry’s album “Teenage Dream” holds for a second week at the pinnacle of the ARIA Album Chart, comfortably staving off Eminem’s “Recovery” which makes another surge towards the top of the chart, moving up from four to two. Taio Cruz’s “Dynamite” chalks up three weeks at number one with sales in excess of Platinum on this week’s ARIA Singles Chart, where the top four singles hold firm from last week. Highlights from this week’s ARIA Album Chart include the highest top 40 debut coming from The Killers’ front man Brandon Flowers, who lands at #5 with his solo debut “Flamingo”. The Killers have had four top 10 results, including their number one debut with “Hot Fuss” in 2005. American band Stone Sour slides in at #6 with “Audio Secrecy”, their second ARIA top 40 result after “Come What(ever) May” peaked at #21 in 2006. After twenty six weeks in the top 40, Angus & Julia Stone continue to enjoy strong sales with “Down The Way”, moving up two places to #7. Fellow Aussies Birds Of Tokyo move back in to the top 10 at 10, with Lady Antebellum just behind them at #12, jumping a massive 22 places with their former US smash, “Need You Now”. Train also enjoys some strong momentum, up from 23 to 14 with “Save Me, San Francisco” and Usher lands back in the top 20 at #19, up from 26 with “Raymond V Raymond”. Taylor Swift moves back into the top 40 for the 74th week with the five times platinum success, “Fearless”, at #37, with AC/DC’s “Iron Man 2” following suit at #38 and Jason Derulo’s self-titled release re-entering at #40. Aussie lads Short Stack take out top spot this week’s ARIA Album Chart with their debut album “Stack Is The New Black”, knocking Michael Jackson from the number one position and becoming the fourth Australian act to top the album chart this year. Their single “Sway, Sway Baby” came close a month ago when it debuted at number two. Bushfire Aid: Artists For The Bushfire Appeal has debuted at number one on the ARIA Compilation Chart, in an incredible show of support from the Australian public. With all artists and songwriters featured on the album donating their songs, and music retailers throwing their support behind it, Sony Music proceeds from the sale of the CD will go to the Salvation Army Bushfire Appeal through the charitable arm of the Australian Sony Group of Companies, The Sony Foundation. Flo Rida storms the ARIA Singles Chart on debut this week, landing top spot with his single “Right Round”, which features singer Ke$ha. It’s also number one on the ARIA Digital Track Chart. “Right Round” is Flo Rida’s second number one single in Australia following “Low”, which spent 3 weeks at number one and was 2008’s highest selling single. It is the first number one debut since Kylie Minogue’s “2 Hearts” in November 2007, and is also the third digital only release to top the ARIA Singles Chart. Lily Allen’s new album, “It’s Not Me, It’s You” has raced straight to number one on the ARIA Album Chart this week, eclipsing her debut album “Alright Still” which peaked at #7 back in 2006. At the same time, “The Fear” has earned Lily her first top 10 on the ARIA Singles Chart, moving up from 13 to 8 this week. In addition to Lily Allen, there are two further top 40 album debuts this week. Coming in at #3 is The Fray with their sophomore release “The Fray”, the follow up to “How To Save A Life” which hit #1 on the ARIA Album Chart in March 2007, some 9 months after release. 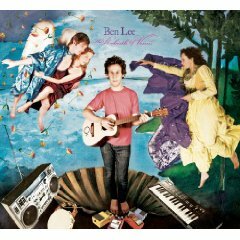 Impacting at #21 is Ben Lee’s “The Rebirth Of Venus”, his sixth album since “Breathing Tornadoes” was released in 1998.